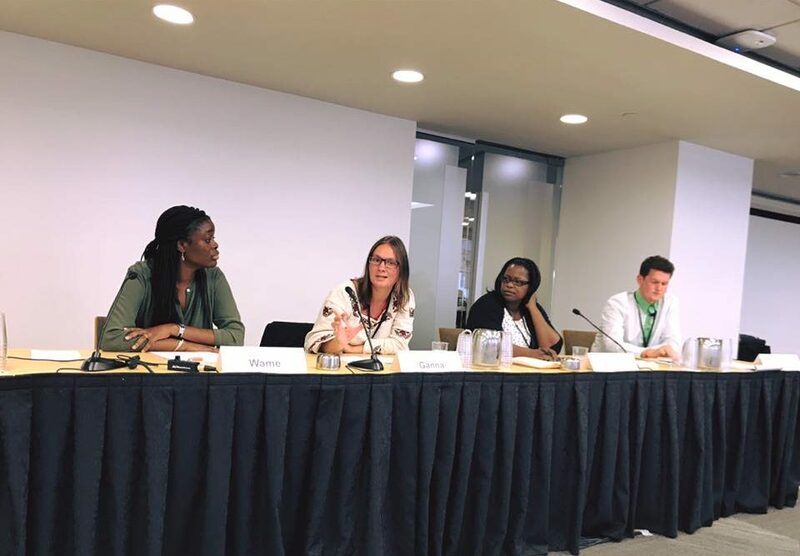 On September 18, 2017, at the Funders Concerned About AIDS (FCAA) AIDS Philanthropy Summit in Washington D.C., ITPC Director of Global Programs and Advocacy Wame Mosime and AIDS and Rights Alliance of Southern Africa (ARASA) Deputy Director Felicita Hikuam spoke at the session titled Civil Society-Driven Actions on Sustainability and Domestic Mobilization for HIV and AIDS, co-sponsored by the Robert Carr civil society Network Fund (RCNF) and Open Society Foundations (OSF). Domestic investment is increasingly accounting for more of the HIV funding pot in low- and middle-income countries. While this appears to be a promising trend, the shift to domestic funding has been rapid, and in most cases unplanned and void of systematic preparation to ensure previous systems and investment remain intact. The result: insufficient funding levels and competing health priorities – which, as civil society knows, translates to inequity in the HIV response. From a human rights and treatment access perspective, this leaves a significant sub-population inadequately served. In most settings, external funding is the only source of funding for key populations. Even in countries like Botswana, which has nearly reached the 90-90-90 targets, it is critical key population groups where HIV prevalence and infect rates are highest that are not being supported by national funding. In 2015 and 2016, with support from the Global Fund through the RCNF, ARASA and ITPC supported partners in Botswana, Malawi and Tanzania to increase their understanding of national and international health funding architectures. This included collaborating with the Centre for Economic Governance and AIDS in Africa (CEGAA) to undertake budget monitoring and expenditure tracking on domestic funding allocated to health, with a focus on HIV-related interventions for key populations. This process highlighted that investment is needed to increase civil society’s knowledge of national and international funding architecture national and international commitments, national budgets and budgeting processes. The advocacy to increase domestic financing for equitable access to treatment and critical enablers, including protection of rights of key populations needs to be understood in the specific social and legal context of continuing criminalization, stigma, and discrimination. Maintaining global solidarity to ensure civil society, national governments, and donors continue to work together. While we gravitate towards domestically sustained programs, we must uphold global accountability. Influencing the creation and revision of better policies at national levels to redirect investment prioritization to help and guarantee governments create and invest in policies and programs that respond real needs, and therefore better predict their HIV response and budgets. This includes having constructive dialogue at national level about critical considerations to make to ensure we sustain response, negating new infections, and ensure groups that are vulnerable are getting the support that they require. Recognizing that the HIV response is borderless, and investments in regional and global networks to support cross-border advocacy (as RNCF & OSF are doing) are a necessity. Revitalizing the shrinking civil society voice and space by supporting and investing in community efforts. This includes funding for advocacy, demand creation, community monitoring, and community-based service delivery (differentiated service delivery). You can watch the full session recording here. Want to know more? Check out our work on health financing, community monitoring, and treatment education.